What Are 5 Top Selling Cookbooks in May of 2015? I’m a huge fan of cookbooks and like to keep up with the best selling ones and share them with you from time to time. So from my research, here are the Top 5 Best Selling Cookbooks at this moment just in case you are looking to add a couple to your collection. I don’t purchase as many cookbooks as I used to. No place to put them. I’m thinking of purchasing a new bookcase and if I do, it won’t take long to fill it. I like finding stuff on the Internet, but there’s just something special about have a cookbook in your hands. How do you feel about it? Who’s Determining These Top 5 Cookbooks? I’m using Amazon.com to determine what are the best selling cookbooks for the month because they must be the biggest seller of books online, they have the best reviews, most of us are familiar with them and I have an affiliate program with them. If you do happened to see a book you are interested in purchasing and purchase from a link on this page, I do make some small amount of revenue but it does help cover some of my costs so I thank you for your support. 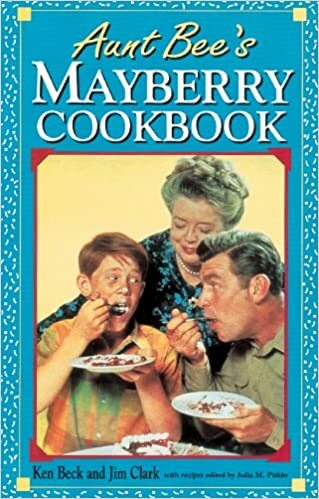 Ok, I’m a huge fan of Mayberry RFD but I’m sure neither Aunt Bee or Frances Bavier, the actress who played her on tv, had much to do with writing these recipes. What I did learn is there are 300 “mouth-watering” recipes, rare photographs from “The Andy Griffith Show” and that many of the recipes are favorites from the cast and crew who worked on the show. I actually had the opportunity to meet Andy Griffith many years ago on a commercial shoot when I worked in that business. I do have to say, I’m a little surprised that this is Amazon’s #1 best seller cookbook. Like I said, I did enjoy the show, but Golly, I can’t remember a single meal they served on it. I received this cookbook as a shower gift ten years ago from my 90-something year old great, great aunt. At the time, I thought it looked a bit hokey…it just goes to show that we young cooks have so much to learn from those that have gone before us! It has all of my family’s favorites — it is usually the place that I can find the recipe for all of those good things I remember from my childhood. I have over 60 cookbooks, and it is one of my most-used! This one is a “must-have”. Very nice spiral bound book. I ordered 6 and held my breath but wasn’t disappointed. It will make a very fun gift for all my cooking friends. Fun pictures and story lines from The Andy Griffith Show. Brought back lots of memories. I am very glad I ordered one for me as well!